U Dvou Zlatych Klicu, which means Two golden Keys is an apartment complex in Prague. U Dvou Zlatych Klicu is housed in a wonderful building of mediaeval origins with preserved mediaeval cellars. The house was re-built in the Baroque style around 1688 and belongs to the group of special cultural heritage sites of Prague. The hotel features large and quiet single, double, triple and quadruple rooms with the total capacity of 46 beds. 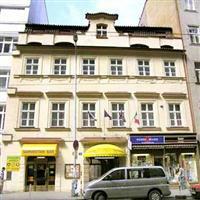 This Prague hotel also offers suites for up to 4 people, that will satisfy the guests wishing more space and comfort. U Dvou Zlatych Klicu apartments offers a good starting point to explore Prague and its wonderful sightseeing attractions. A dedicated staff will help guests with a precious ticket service and advice on cultural, social and sports events in Prague. Enjoy your stay at the U Dvou Zlatych Klicu!